1863 – in which the good people of Wing miss out on a big party thanks to typhoid, but get a new well. A meeting of some of the principal inhabitants was held in the school room, Wing, on Friday last, to consider what steps should be taken to give effect to a proposal, made by the Vicar (a copy of which we give in our third page) to construct a deep well with pumps in the village, as a permanent memorial of the marriage of the Prince of Wales. 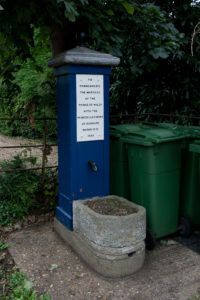 It was thought by some that there were already many wells in the village, the water of which, with proper care, would be always perfectly good and wholesome, and that such pump was not required, but, as no other plan was agreed upon, the meeting separated with an understanding that subscriptions would be invited for the object proposed. An opinion was also expressed that, on account of the sickness still prevailing in the village, no festivities of a public character should be encouraged, it being hoped that individual employers of labour would each give some entertainment to their own people and the families. On the day of the Royal Marriage the children of the Sunday school at that place were given a treat by the Rev P.T. Ouvry, and each child furnished with a medal. By the permission of the Board of Guardians we are able to lay before our readers the following extract from the report of Dr Ord, the medical officer deputed by the Privy Council to make an investigation with reference to the fever which has prevailed in this parish, and which, though partially abated, still lingers in some parts of the village. We give, in addition, the letter which accompanied the report. Sir – With reference to the late very serious prevalence of typhoid fever in the village of Wing, and with reference to the inquiry which the Lords of Her Majesty’s Council directed to be made into the causes of that epidemic, the Lords of the Council desire me to transmit to you the enclosed extract from their Medical Inspector’s report on the subject, and to request that you will, at the earliest opportunity, bring the matter under the particular consideration of your Board of Guardians. It appears to their Lordships that the visitation of a disease which has prostrated nearly a seventh part of the population of Wing, has been due principally to two causes:- first that offensive house refuse instead of being regularly and thoroughly removed from the vicinity of dwellings; and that the filth thus kept, together with other refuse in manure heaps and pigsties, not only gives offensive effluvia which are likely to be injurious to health, but also, by soaking into the soil, greatly contaminates the surface wells which supply water to the population. Secondly, that the interiors of cottages are to a considerable extent, ill-ventilated and unclean, and that within these cottages there often is such extreme crowding as to facilitate in the utmost possible degree the spread of infectious diseases. My Lords regard it as indispensable for the health of the population of Wing, that these evils should at once be effectually dealth with. And their Lordships (believing that the Board of Guardians, by a vigorous application of the Nuisances Removal Act, can, in great part, succeed in removing them) request that, when your Board has considered the subject, you will have the goodness to let me know, for the Lordship’s information, what means your Board directs to be taken for the sanitary improvement of the village. I am to add that, besides these proceedings, which the Board of Guardians is legally competent to take in this matter, a measure greatly to be desired for the health of the population, is that there should be established in the village some abundant source of public water-supply, well-protected against those filthy and fatal pollutions to which the present surface wells are exposed, and it would be a great satisfaction to their Lordships if they could learn that the village is likely to possess so important a safeguard as this would be against one of the most frequent causes of dangerous epidemic disease. I am, Sir, your obedient servant, John Simon. The general appearance of the village is remarkably clean and pleasing: the roads are well kept, the paths are smooth and edged with stone, and the exterior of the cottages neat. There is a fair though far from perfect system of street drainage, with gratings for the reception of slops from houses. A large proportion of the houses forming the village are labourers’ cottages, which are arranged in continuous rows along the street. Some of these are roomy and well ventilated; but the interiors of the greater number of those which I visited were cramped, ill-lighted, and ill-ventilated. Many of these are inadequate, as dwellings, to the number of persons living in them. Such are the numerous houses in which there are only two rooms, one below and one above for the use of six, eight or ten persons; the upper room being generally used for sleeping, the lower for cooking and lay use. I measured a room of this kind in which seven persons slept; it was twelve feet square and barely seven feet high, and had only one small window, which could not be opened. Another room in which five persons slept, measured fourteen feet by eight, with sloping walls rising to the height of about eight feet. The houses near the gate of the Vicarage in Chapel Yard, at the back of Chapel Yard, and in several parts of Church Street are of that sort, though, of course, with varying dimensions. The windows in such cottages are unusually small; those in the lower room are often fixed, but the bedroom windows can generally be opened. Very few of the bed-rooms have fire-places, and the ventilation of them is very imperfect. The inside of cottages in Wing is, for the most part, much worse kept than the outside. A large proportion of the cottages require whitewashing, and the smell of the close, ill-ventilated rooms is often very offensive. The premises around cottages are generally well kept, but there are nuisances in the shape of obstructed slop channels, of refuse heaps, too near houses and wells, and of one or two large privies placed too near houses, which I pointed out to the local authority as demanding immediate attention. The privies are generally at a safe distance from houses, but they are frequently ill-made, and foul, and are numerically scanty in proportion to the number of persons using them. The slop drains are in some places obstructed, and give rise to nuisances. This is especially to be noted in the case of the drains adjoining the houses near Wing Park Gate, where the pipe leading from the channels in the back yard of a row of houses, passes under one house and across the street, receiving on its way the road water through a grating in front of the houses. There is much stench from the grating and from the mouth of the pipe. The ditch above-mentioned, and the outfalls of the drains at the two ends of the village are in a dirty and offensive condition, and complaints are made that stinks issue from some of the street gullies. The water supply of the village is entirely derived from shallow wells, dug through the gravel to the clay, in which little basins are cut for the accumulation of water. Such wells, fed by surface percolation through a light soil, are evidently liable to pollution; and in three instances, at least, there is reason to believe that pollution has taken place. There are four groups of houses in which fever was most virulent. These were, first, the houses at the end of Church Street, close to the church yard. These are 10 in number. Two at the end furthest from the church are well built, with nuisances, and with a private well. In these there was no fever; in the others 11 cases occurred, and their inhabitants are generally sickly and subject to diarrhea. In one of them I saw three persons suffering from fever, two men and a young woman, lying in one room. The houses are very small and cramped, and behind them is the second well of which I have spoken above. The two privies near the well were in a dirty state and there was much excrement lying about the approaches. Among nuisances requiring particular notice are, the refuse heaps, which, formed for the purpose of making manure, are frequently kept close tot the back doors of houses. The second group is called Church Row and, with Ginger’s Yard adjoining, contains 15 houses. In the six houses of the row nearest to the high street, which are well built, only one case occurred, in a family of nine persons. In the other houses, which are smaller, and generally with only two rooms, but provided with large moveable windows, there were 26 cases, and two deaths from fever. In one of these houses 10 persons sleep in a bed-room and a closet. The bed-room, which is small, accommodates 8 of the number. Four severe cases occurred in this house. Behind these houses is the third well of which I have spoken, and the refuse pit (in which I have reason to believe that I saw fever excrements) lies between the well and the houses. The third group is called Staples’ Yard, and abuts on the High Street. In the five houses forming this group 18 cases occurred, 8 of them in one house. The associations are – a foul privy in a corner between houses, dirty back and front yards with refuse heaps, foul slop channels, and a well of very doubtful purity, combined with house arrangements similar to those already described. The last group is less defined. It embraces the houses in Chapel Yard, the houses at the back of the yard, and a few houses around. Conditions similar to those before mentioned are repeated here, namely, small rooms, with bad ventilation, suspicious water supply, and various nuisances in the shape of refuse heaps and dirty privies. The following report with respect to the Wing well-water made by Professor Miller has been received by the Board of Guardians of the Leighton Buzzard Union from Her Majesty’s Privy Council. The burials of Wing for the winter months demonstrates there was a spike in 1862-1863, most likely attributable to typhoid although the reason for the deaths are not noted in the register. A public meeting of the principal inhabitants of the parish of Wing was held in the schoolroom on Thursday last, at which the churchwardens and overseer were authorized to get a plan and estimate for a public well in connection with the present, or a proposed system of drainage for the parish. Mr Beasley were present at the meeting, on behalf of Lord Overstone, the principal landholder, and undertook to use his influence that all the wells on the premises held under the Lord of the Manor, should be put and kept in a satisfactory state. The resolution was carried unanimously, and an opinion was generally entertained, that the parish should be put under the Public Health Act without delay.